Democrats increasingly say law has had a positive impact on U.S. The public’s views of the Affordable Care Act, which were evenly divided following the Supreme Court’s ruling last summer upholding a key section of the law, are again more negative than positive. 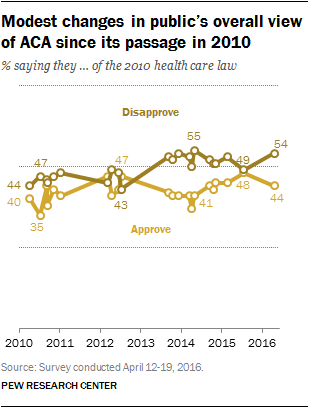 Currently, 44% approve of the 2010 health care law, compared with 54% who disapprove of the law. In July 2015, after the Supreme Court upheld the federal government’s ability to provide insurance subsidies through federal exchanges, nearly equal shares approved (48%) as disapproved of the law (49%). Over the prior two years, somewhat more disapproved than approved of the law. However, the balance of opinion about the law’s impact on the country has grown less negative over the past three years, even as slightly more continue to see the impact as negative than positive. Currently, 44% say the law’s impact on the country has been mostly negative, 39% say it has been mostly positive and 13% say it has not had much of an effect. 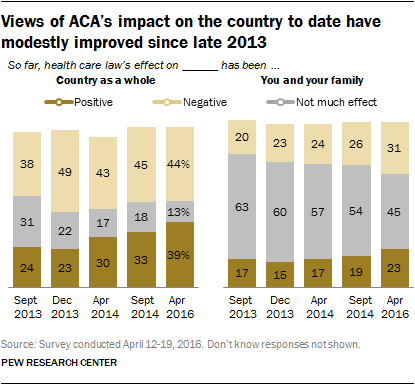 In December 2013, amid the flawed rollout of the health exchanges, opinions about the law’s impact on the country were much more negative than positive: 49% saw its impact as largely negative while fewer than half as many (23%) said it had had a positive effect on the country as a whole (22% said it hadn’t had much of an effect). Since that point, positive views of the law’s impact on the country have increased 16 percentage points (from 23% to 39%), while there has been a modest decrease in negative views (49% then, 44% today). Most of the rise in positive views of the law’s effect on the country has come among Democrats and independents. The share of Democrats who view the law’s impact on the nation positively has risen 24 percentage points (from 42% in December 2013 to 66% today), while the share of independents who say it has had a positive impact has risen from 17% in December 2013 to 36% today. Only one-in-ten Republicans (10%) say the law has had a positive effect on the country, little changed since 2013. The latest national survey by the Pew Research Center, conducted April 12-19 among 2,008 adults, finds that opinions about the law’s personal impact – and its expected effects going forward – have shown modest changes over time. 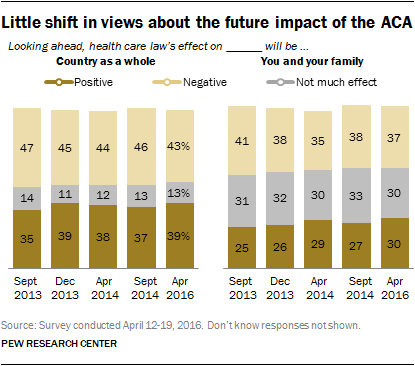 More adults (31%) say the health care law has had a mostly negative effect on themselves and their families than say it has had a mostly positive one (23%), while 45% say it not has had much of an effect. The share saying the law has not has much an effect has declined over the past three years, but the balance of opinion about the law’s personal impact has remained more negative than positive. By roughly the same margin (37% to 30%), more say that, looking ahead, the health care law will have a mostly negative than a mostly positive personal impact, while 30% say it will not have much of an effect. This is little changed over the last few years. Views of the law’s future impact on the country are mixed (43% mostly negative, 39% mostly positive). Three years ago, 47% expected the law to have a mostly negative effect on the country, while 35% expected its impact to be mostly positive. Currently, 78% of Democrats approve and just 19% disapprove of the Affordable Care Act (ACA), little changed in recent years. Among Republicans, just 9% approve and 89% disapprove of the law. The share of Republicans who approve of the law rose from 11% in February 2015 to 18% last July, before falling back to 9% in the new survey. Independents’ support for the law also has declined since July, from 45% to 39%. That change has come entirely among independents who lean toward the Democratic Party. Currently, 59% of Democratic-leaning independents approve of the health care law, compared with 71% last summer. Only about one-in-five Republican-leaning independents (18%) approve of the law, little changed since July (17%). While approval of the health care law has slipped among Democratic-leaning independents, in March a large majority of Democratic leaners (73%) said it is the government’s responsibility to make sure all Americans have health insurance coverage. The share of Democratic leaners saying the government has a responsibility to provide health coverage for all has ticked up since 2014 (67%). Aside from the partisan divisions over the law, there continue to be wide racial and age differences in opinions about the ACA. Whites disapprove of the law by nearly two-to-one (64% vs. 33%). Conversely, blacks overwhelming support the law (83%), as do a majority of Hispanics (57%). As in the past, young people view the ACA more positively than do older adults. Among those younger than 30, about as many approve (50%) as disapprove (47%) of the health care law. Among older age groups, more disapprove than approve. Republicans and Democrats have largely opposing views about the impact of the health care law on the country so far. Close to three-quarters of Republicans (72%) say the law has had a mostly negative effect thus far. Democrats offer more upbeat ratings of the law’s national impact: About two-thirds of Democrats (66%) say it has had a mostly positive effect. The percentage of Democrats who see the law’s impact on the nation as mostly positive has increased 10 points (from 56% to 66%) since September 2014, and is up 25 points from a year before that (in September 2013, just 41% of Democrats said the law had had a positive impact). Views among Republicans have shifted only modestly since December 2013. In the wake of the troubled rollout of Healthcare.gov as part of the Affordable Care Act, negative views of the law’s impact among Republicans increased from 59% to 74%, and they have remained at similar levels since. Among independents, about half (48%) say that the law has had a mostly negative effect on the country as a whole, little changed over the last few years. However, the share saying the impact is mostly positive has grown: 36% now say this, up from 28% in September 2014. As with overall opinions about the ACA, views of its impact – on the country and personally – are divided along racial lines. About half of whites (52%) say the law has had a mostly negative impact on the country, while just 31% view its effects as positive. A majority of blacks (64%) and about half of Hispanics (51%) say the law’s effect on the country has been mostly positive. And while about four-in-ten blacks (39%) and Hispanics (40%) say the law’s personal impact has been mostly positive, just 16% of whites say the same. People with lower family incomes also express more positive views of the ACA’s effects than do those with higher incomes. About a third (34%) of those with family incomes of $30,000 or less say the law’s effect on themselves and their families has been mostly positive, compared with just 18% of those with higher family incomes. Those who approve of the law overwhelmingly say the law’s impact on the country has been mostly positive, while about half (48%) view its personal impact positively. Opinions among those who disapprove of the law are almost the reverse: 74% say it has had a mostly negative impact on the country while 55% say the law’s impact on them has been mostly negative. For the most part, opinions about the law’s future effects follow similar patterns. About seven-in-ten Republicans (71%) say the law will have a mostly negative impact on the country, while 61% expect it will have a largely negative effect on themselves and their families. Two-thirds of Democrats (67%) view the law’s future impact on the country positively, while 51% say it will have a positive personal impact.